What’s New With The AOL Postmaster Site? 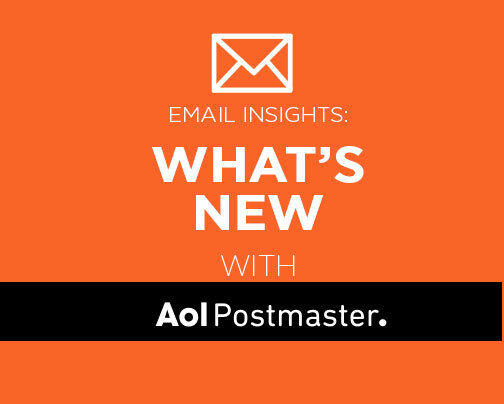 Blog Email Deliverability Deliverability What’s New With The AOL Postmaster Site? AOL announced the release of a new Postmaster website last week, and the industry was abuzz at the relaunch of such a critical tool. AOL set a high bar when they first launched their Postmaster site more than a decade ago. It was the first time a major receiving ISP detailed the rules of engagement for high volume senders. For example, AOL famously was the first ISP to publicly document their bounce codes, making it simple for senders to understand why their email wasn’t delivering. At the time it went live, email marketing resembled the Wild West, but AOL’s efforts helped set the standard for how senders should engage with mailbox provider personnel, their systems, and their customers’ inboxes. Sites like AOL Postmaster remain an invaluable resource for helping new marketers and established providers alike ferret out their deliverability problems. LC: We really felt that our site was out-of-date, both informationally and the look and feel. A team edited and re-wrote a lot of the content and also reorganized how it was presented. What did you hope to accomplish? Fewer tickets? LC: We really wanted to make it easier for people to navigate and provide a better resource. If that was less tickets, yes that is a great outcome, but our main goal was better information. What’s new? I noticed the FBL signup process looks a little different. LC: We removed obsolete and unhelpful content and added new information based on changes in the industry. We tried to provide more guidance where it made sense for users opening tickets. What should the takeaway be for senders? LC: The website is a resource and an aid, but there is no replacement for good sending practices. There you have it folks. Now you have an even better resource for troubleshooting delivery issues at AOL. Be sure to check it out! And, as always, the deliverability team here at Message Systems is working closely with big receiving ISPs like AOL to help our SparkPost Elite customers achieve the industry’s best deliverability, period. Find out more at https://www.messagesystems.com/products/sparkpost-elite.